Protecting over 100 square miles of parkland, ranchland and rural communities, the units of Point Reyes Station have been providing fire, medical, and rescue emergency services to citizens and visitors in West Marin since the first station was built in the late 1950’s. 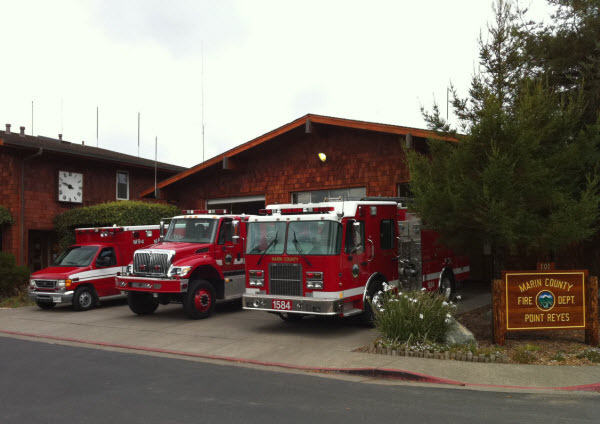 Located near downtown Point Reyes Station the fire station was rebuilt in 1984. The building also contains the Marin County Sheriff’s Office sub-station, a HAM radio disaster communication command center, and a widely used community meeting room. Starting in 1976, in Point Reyes, the Marin County Fire Department started one of the first Paramedic Ambulances in Marin County. Housed in the Fire Station are five units; a Structural Firefighting Engine, a Wildland Firefighting Engine, a Paramedic Rescue Ambulance, a utility pick-up truck and a Flood evacuation boat. This flood evacuation boat was funded through the Point Reyes Disaster Council, an organization made up of Point Reyes area citizens that have partnered with the Fire Department and other agencies to provide additional disaster response to major incidents in West Marin. Units from Point Reyes Fire Station respond to emergencies in other jurisdictions, and have developed a close working relationship with these other agencies. These allied agencies include the Bolinas Fire Department, Inverness Fire Department, Stinson Beach Fire Department, and the Tomales Fire Department. Additional partners include United States Park Service Rangers and Firefighters from the Point Reyes National Seashore and Golden Gate National Recreation Area; and State Park rangers in Tomales Bay State Park. By partnering with the community and other agencies, Marin County Fire Department personnel at Point Reyes will continue to meet the unique needs of the communities in West Marin and for the over one million visitors per year to the area. Automatic-aid is provided to the Inverness Public Utility District.